In Francois Truffaut’s The Bride Wore Black (1968), Jeanne Moreau portrayed a woman driven to kill after the reckless accidental shooting of her new husband. In that film, one of Truffaut’s more interesting homages to Hitchcock, her character relentlessly pursues vengeance, methodically seeking out and taking out the men responsible for her groom’s death. Two years earlier, in Tony Richardson’s Mademoiselle (1966), Moreau played a similar sort of dark angel. In this film her character was even more sinister, with motives far less clear-cut. San Francisco’s fourth French film noir festival, The French Had a Name for It 4, at the Roxie Theater from November 3 through November 6, closes with a tribute to Moreau, the revered French icon who passed away on July 31 at age 89. The program for the final night of noir begins with The Strange Mr. Steve (1957), featuring Moreau as a gangster’s moll. The last film on the last night of the program is Mademoiselle. 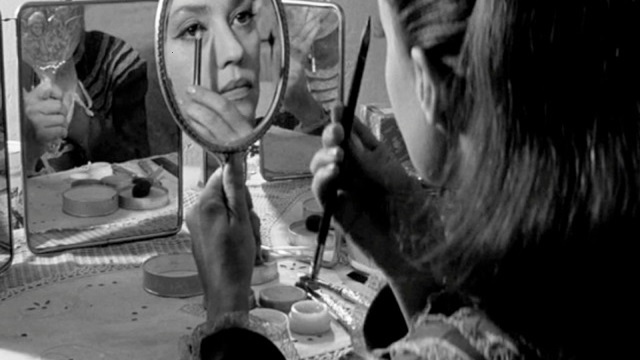 Jeanne Moreau began her film career in 1949 after getting her start on the French stage, and would emerge as a rising starlet by the mid-1950s. In the late '50s - after, in Moreau's withering assessment, "nine years of bad films" - she made two important movies with director Louis Malle, Elevator to the Gallows (1958) and The Lovers (1959), that would simultaneously change and advance her career. Elevator to the Gallows signaled the oncoming zeitgeist of French New Wave and The Lovers gave Moreau an opportunity to portray a daring and sensual modern woman - essentially to create a type all her own. The actress would soon become emblematic of Art House cinema. By the time she came to Mademoiselle in 1966, Moreau already had behind her La Notte (1961) for Antonioni, Jules and Jim (1962) for Truffaut, Diary of a Chambermaid (1964) for Bunuel, Viva Maria! (1965) again with Malle, and Chimes at Midnight (1965) for Orson Welles. It was her time. In Mademoiselle, Moreau portrays an acutely repressed school teacher. "Mademoiselle" (she nameless throughout the film) has left the big city, we know not why and can't help but wonder. She now toils in a provincial French village. Here she oversees her classroom by day and sneaks through the countryside by night, still wearing heels, wreaking havoc on the town: setting fires, triggering floods, poisoning livestock. She secretly lusts after a handsome Italian lumberjack (Ettore Manni in a role first intended for Marlon Brando) who works locally and whose son she mercilessly bullies at school. But Moreau’s character, obsessively pristine in public, has ingratiated herself into the community and become a respected local figure. Soon an innocent man, an outsider, will become the prime suspect for her twisted crimes. Only the lumberjack’s son knows the truth about mademoiselle’s perverse nature and only he will comprehend the depth of her cruelty. Based on a story by Jean Genet and adapted for the screen by Genet, Marguerite Duras and others, Richardson made of Mademoiselle a blindingly visual film. The eye is dazzled by David Watkin’s (Catch-22, Chariots of Fire, Out of Africa) black and white photography of forest, field, stream, lake, and shore. Dialogue is spare, there is no music on the soundtrack, only the sounds of man and nature. And Moreau is devastating as the lethal mademoiselle. Although Mademoiselle was nominated for the Palme d’Or at Cannes and was nominated for BAFTAs for black & white cinematography and costume design (for which it won), it was savagely panned by critics as diverse as Pauline Kael, then with McCall's, and Bosley Crowther, not long before his ouster from the New York Times. Tony Richardson, who’d recently won Oscars for Best Picture and Best Director on Tom Jones (1963), was singled out and raked over the coals for what was perceived as artistic pretense, among other things. In hindsight, it seems likely that critics and others of the day who scrutinized or over-analyzed Mademoiselle simply got lost in their own fevered interpretations, unable to appreciate the film's cinematic qualities on their own merit. Mademoiselle is mesmerizing...obscure...disturbing. A woefully underrated work from Richardson and Moreau, it lingers after viewing, not soon to be forgotten. The French Had a Name for It 4 runs from November 3 - 6 at San Francisco's Roxie Theatre. For more information, click here. I saw this back in '65 or '66 and was blown away bit. I have a DVD of it, but honestly have not watched it in a long time. Need to take another look. Moreau is amazing! I haven't seen this one Lady Eve, a film noir indeed. I can imagine it was just too noir for the likes of a school teacher played by a distinguished actress for the critics or the public to appreciate. The existentialism of it must have appealed to some, I imagine. I'll have to look for it. Thanks for covering this one Lady Eve. This is a very interesting film, Christian, would like to hear your take if/when you see it.